Thinkers 50 by Ciaran Parker is an interesting book with a short description about The World's 50 Most Influential Business Writers and Leaders..
Few of them are as below. Parker, Ciaran. "Assembling the 50". 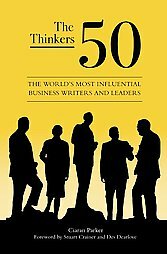 The Thinkers 50: The World's 50 Most Influential Business Writers and Leaders.Praeger Publishers. © 2006.